American made jewelry with a high quality appearance transformed from your artwork, Logo, or Trademark by our designers and UNION manufacturing facility. Black and white line art is used to create the models molded in a CENTRIFUGAL CASTING process to create finely detailed pieces. 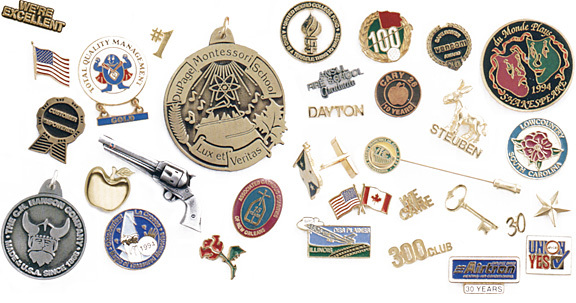 These pewter-like metal emblems are then electroplated and finished with hand applied, soft enamel and epoxies to provide jewelry items with a high perceived value, at a reasonable price, with a short delivery schedule.